The Seafront Without A Sea View! New Brighton Promenade was the £1 million-plus big enterprise of the 1930s. It was the stuff of controversy. There were those who looked on it as a white elephant of the town, a municipal blunder. It is the sea front from which you cannot see the sea, unless you happen to be over six feet tall. 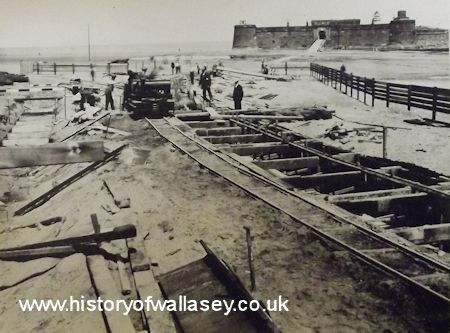 It is almost a century since the Wallasey Corporation Act gave it birth. 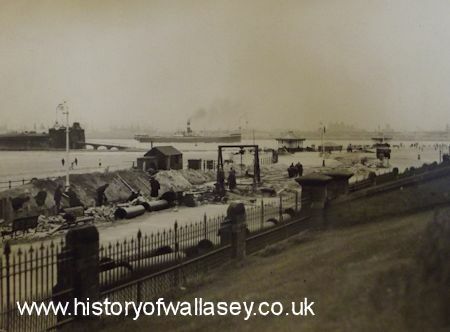 Up to 1891 the river frontage was largely open to the shore, with the exception of small areas adjoining Seacombe and Egremont ferries and the notorious Ham and Egg Parade, at New Brighton. In 1891, after treaty arbitration and litigation with private owners over land and shore properties, the first length of promenade was built between Egremont and Holland Road. The year 1897 saw its extension to a point just beyond New Brighton Pier. In 1901 the portion between and Egremont and Seacombe was built. Between 1906 and 1908 there were extensions from the pier to the western boundary of Marine Park, replacing the ‘Ham and Egg’ with its boarding houses, cafes and amusement parlous. Before the building of the promenade, sand drifted in great mounds. 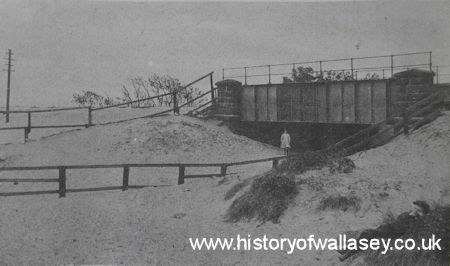 In the above picture it is shown at the level of the railway line between New Brighton and Grove Road. Following in the wake of the promenade development there came development of the immediate backland, with the North Seacombe ‘Little Park’, Guinea Gap Baths, the Town Hall, Vale Park, the Tower Grounds and Victoria Gardens. In 1927 they announced plans for Kings Parade, and the town buzzed with excitement. There was to be a massive concrete sea wall, a promenade 110 feet wide, with 46 acres of public gardens, a marine lake of ten acres, a huge open air bathing pool and approach roads. Thousands of men were unemployed on Merseyside in the late 1920s. The Unemployed Grants Committee approved the scheme for grant purposes. Rows in the Town Council over the project went on month after month. It became the town’s big talking point. Some called it a great big burden, and “windswept and useless”. Others said it would make New Brighton Britain’s premier garden city by the sea. Work started in 1931. It took three years to build the promenade as far as the Red Noses. The cost was £531,000 (about £33 million in today’s money). The loss of the old ‘Noses’, outcrops of sandstone under which generations of townsfolk had laid out their summer picnics, was very much lamented. “In order to acquire this monstrosity of a promenade the town is having to sacrifice many of its most picturesque and pleasant features,” said an angry reader of the ‘Wallasey News’ in 1932. 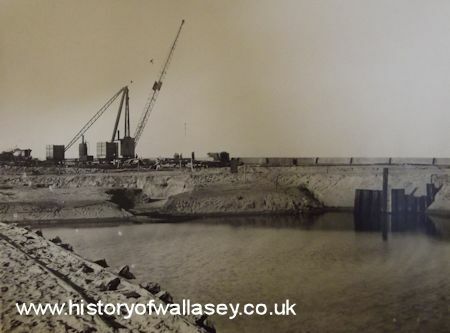 Work on the stretch of the promenade to Harrison Drive was finished in 1939. The war brought a halt to the scheme. Of all the developments in Wallasey over the last century, the promenade at New Brighton was easily the costliest and the most criticised. The promenade would cost the town most of its fine sand, said the critics. It would be a burden for years. For many years after rows continued. Many believing the promenade was a waste of time and money. They said it did nothing but take away acres and acres of fine shore. They said it was a massive mistake. Certainly it has some peculiar features. The substitution of a wide stone parapet for railings has the result that anyone under six feet in height cannot see the sea or the sands below. The seats set into the wall face inwards, and there is nothing to look at but a vast of concrete paving, a hotel and a car park. But there is also something impressive there. It is one of the longest promenades in the country, and on summer days it accommodates with ease the crowds who come to park cars and picnic. It gave work to a lot of men who were going through a valley of despair in the years of the depression. Is it really so white an elephant as some people painted it? It is a bumper blunder? It is a huge ‘lung’ in a town that was rapidly becoming built up. Its spaciousness was refreshing. The wind on your face from the Irish Sea there is quite a tonic. You never feel crowded there, hemmed in.